Pumpkins are everywhere in October and November, and it seems that most of our favorite foods come out with pumpkin spice flavors. If you need to choose a few homemade pumpkin desserts to make for family and friends, you can't go wrong with one of these pumpkin and cream cheese combinations. 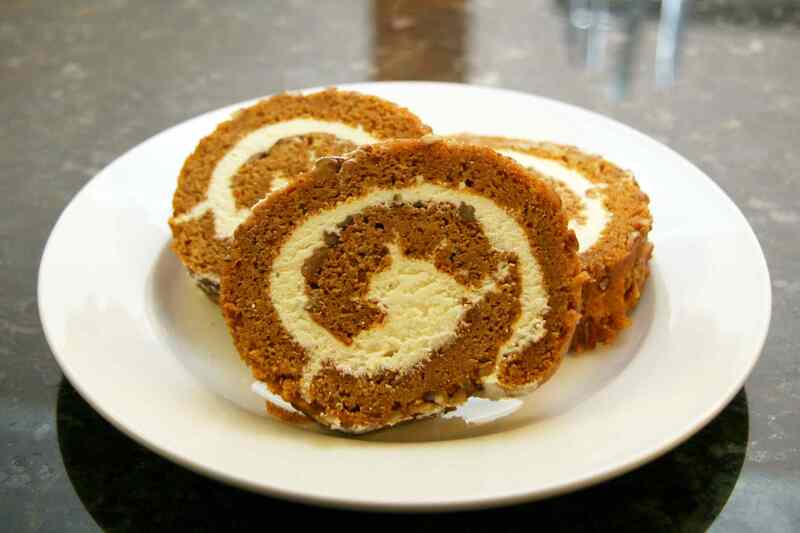 This cream cheese-filled pumpkin cake roll is always a hit. Take it to the office party or keep slices in the freezer for holiday guests. It's surprisingly easy to bake, and you might even get a standing ovation! This layered pumpkin cheesecake is baked in a prepared graham cracker pie crust, so there is no need for a special springform pan. Use a ready crust or homemade graham cracker crust. The filling is made with a vanilla cream cheese layer and a layer of lightly spiced pumpkin cream cheese. Top it with whipped cream and a drizzling of caramel or butterscotch sauce for a beautiful presentation. These big, soft pumpkin cookies are sandwiched together with a fluffy cream cheese filling. Use a purchased cream cheese frosting if you're pressed for time. This no-bake pumpkin pie is so easy to make it is ridiculous, and the flavor is out of this world. It takes about 10 minutes to prepare the spiced pumpkin and cream cheese filling and spoon it into the ready-made pie shell. That's it. Just make it in advance so it has time to chill thoroughly. These cake-like pumpkin bars are finished with swirls of cream cheese batter. They look and taste wonderful! A sweetened cream cheese filling takes this pumpkin quick bread to the next level. This bread has its own built-in spread, and it is delicious. This pie is made with a cheesecake layer and a classic pumpkin pie layer. It is truly the best of both worlds! Top it with a dollop of whipped cream and a little cinnamon sugar. This moist and easy cake is bursting with pumpkin and spice flavor. Pipe the browned butter cream cheese frosting onto individual servings or spread it over the whole cake. These pumpkin cinnamon rolls are the perfect holiday morning treat. Or make them for a sweet snack. Pumpkin butter and cream cheese make up the filling for this quick and easy no-bake pumpkin pie. This moist pumpkin cake would make a fabulous dessert for your Thanksgiving menu or fall event. Make the cake ahead of time and freeze the layers.